APTRANSCO Assistant Engineer Syllabus The latest Andhra Pradesh Transmission Corporation i.e APTRANSCO Assistant Engineer Syllabus and APTRANSCO AE Exam Pattern have been updated on this page. So, the candidates who are appearing for APTRANSCO Assistant Engineer Exam can download APTRANSCO AE Syllabus along with the APTRANSCO AE Exam Pattern on this site. 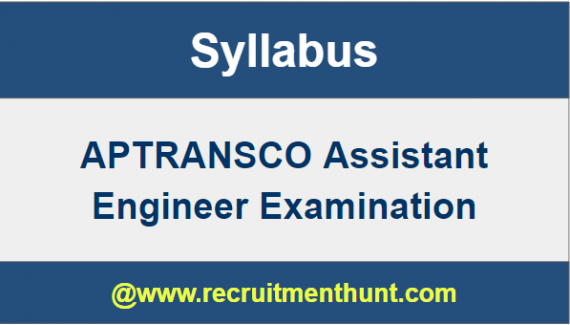 Also, Download APTRANSCO Assistant Engineer Syllabus PDF from the link given below. Aspirants who applied for APTRANSCO Recruitment 2018 will be searching for APTRANSCO AE Syllabus. Hence for those candidates, we have provided below the detailed APTRANSCO AE Syllabus for Assistant Engineer Posts. You can also find the APTRANSCO Assistant Engineer Exam Pattern 2018-19 in the below sections. For candidates who are attending the APTRANSCO AE Exam knowing the APTRANSCO AE Exam Syllabus & Test Pattern is mandatory because there will be huge competition for the APTRANSCO AE Jobs. So, the individuals must check and download APTRANSCO Assistant Engineer Syllabus & APTRANSCO AE Exam Pattern and make a proper and better preparation plan. Follow the schedule and get a good score on the APTRANSCO AE Exam. Stay tuned to our website Recruitment Hunt regularly to know latest updates regarding all Government Jobs. No of Posts Various Posts. APTRANSCO AE Selection Process Written Examination. Starting date to Apply Online for APTRANSCO AE Jobs Update Soon. Closing date to Apply Online APTRANSCO AE Recruitment Update Soon. APTRANSCO AE Exam Date Notify Later. Transmission Corporation of Andhra Pradesh Limited recently issued an employment notification for the Job seekers. According to APTRANSCO AE Notification 2018 for various vacancies of Assistant Engineer (Electrical & Civil) Posts are released. All the interested and eligible candidates have been applied for this APTRANSCO AE Notification 2018. After applying for the Transmission Corporation of Andhra Pradesh Limited Recruitment 2018, the applicants must refer the APTRANSCO AE Syllabus and APTRANSCO AE Exam Pattern 2018-19. Before going to start the exam preparation, the individuals should download the APTRANSCO Assistant Engineer Syllabus so that they can get an idea about the important topics asked in the examination. Also, check the APTRANSCO Assistant Engineer Test Pattern to know the structure and difficulty level of the APTRANSCO Assistant Engineer Exam. The APTRANSCO AE written test will be of Objective Question Type with Multiple Choice. There are two sections in the APTRANSCO Exam. They are Section A and Section B. The Section-A consists of 70 Core Academic questions on respective discipline and Section-B is Analytical Aptitude part & contains 30 marks. In APTRANSCO AE Recruitment each question carries one mark and overall marks for APTRANSCO AE Exam are 100 Marks. The total time duration for attempting the AE Paper is 2 Hours. Written Exam to Fill OMR (Optical Mark Reader) type answer sheet. The complete and detailed APTRANSCO Assistant Engineer Syllabus is as follows. Finally, Candidates can download APTRANSCO Assistant Engineer Syllabus here. So, Applicants can make their preparation easier by following APTRANSCO Assistant Engineer Syllabus. Download APTRANSCO Assistant Engineer Exam Patterns along with APTRANSCO Assistant Engineer Previous Year Question Papers 2018-19 on this article. Also, For more Job Updates stay Tuned to our site Recruitment Hunt.